Electrical resistance along the continuous electric arc creates heat, which ionizes more gas molecules (where the degree of ionization is determined by temperature), and as per this sequence: solid-liquid-gas-plasma; the gas is gradually turned into a thermal plasma. A thermal plasma is in thermal equilibrium; the temperature is relatively homogeneous throughout the atoms, molecules, ions, and electrons. The energy given to electrons is dispersed rapidly to the heavier particles by elastic collisions, due to their great mobility and large numbers. Current in the arc is sustained by thermionic emission and field emission of electrons at the cathode. The current may be concentrated in a very small hot spot on the cathode; current densities on the order of one million amperes per square centimeter can be found. Unlike a glow discharge, an arc has little discernible structure, since the positive column is quite bright and extends nearly to the electrodes on both ends. The cathode fall and anode fall of a few volts occur within a fraction of a millimeter of each electrode. The positive column has a lower voltage gradient and may be absent in very short arcs. 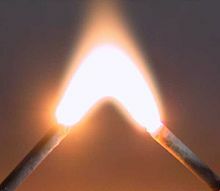 An electric arc has a non-linear relationship between current and voltage. Once the arc is established (either by progression from a glow discharge or by momentarily touching the electrodes then separating them), increased current results in a lower voltage between the arc terminals. This negative resistance effect requires that some positive form of impedance (as an electrical ballast) be placed in the circuit to maintain a stable arc. This property is the reason uncontrolled electrical arcs in apparatus become so destructive since once initiated, an arc will draw more and more current from a fixed-voltage supply until the apparatus is destroyed. ^ Ayrton, Hertha (2015). Electric Arc (CLASSIC REPRINT). S.l: FORGOTTEN BOOKS. p. 94. ISBN 978-1330187593. ^ Luckiesh, Matthew (1920). "Artificial light, its influence upon civilization". Nature. 107 (2694): 112. Bibcode:1921Natur.107..486.. doi:10.1038/107486b0. hdl:2027/chi.14153449. OCLC 1446711. ^ "Arc". The Columbia Encyclopedia (3rd ed.). New York: Columbia University Press. 1963. LCCN 63020205. ^ Davy, Humphry (1812). Elements of Chemical Philosophy. p. 85. ISBN 978-0-217-88947-6. This is the likely origin of the term "arc". ^ a b "Tracking down the origin of arc plasma Science-II. Early continuous discharges". by André ANDERS. IEEE Xplore, ieee.org. IEEE Transactions on Plasma Science. Volume: 31, issue: 5, Oct 2003. ^ Kartsev, V.P. (1983). Shea, William R. (ed.). Nature Mathematized. Boston, MA: Kluwer Academic. p. 279. ISBN 978-90-277-1402-2. ^ a b c d Howatson, A.M. (1965). "An Introduction to Gas Discharges". Plasma Sources Science and Technology. 9 (4): 47–101. Bibcode:2000PSST....9..517B. doi:10.1088/0963-0252/9/4/307. ISBN 978-0-08-020575-5. ^ Mehta, V.K. (2005). Principles of Electronics: for Diploma, AMIE, Degree & Other Engineering Examinations (9th, multicolour illustrative ed.). New Delhi: S. Chand. pp. 101–107. ISBN 978-81-219-2450-4. ^ "Laser beams make lightning tunnels". Retrieved 2015-06-20. ^ Clerici, Matteo; Hu, Yi; Lassonde, Philippe; Milián, Carles; Couairon, Arnaud; Christodoulides, Demetrios N.; Chen, Zhigang; Razzari, Luca; Vidal, François (2015-06-01). "Laser-assisted guiding of electric discharges around objects". Science Advances. 1 (5): e1400111. Bibcode:2015SciA....1E0111C. doi:10.1126/sciadv.1400111. ISSN 2375-2548. PMC 4640611. PMID 26601188. ^ "Arc Suppression". Retrieved December 6, 2013. ^ Harper, Charles A.; Petrie, Edward M. (2003). Plastics Materials and Processes: A Concise Encyclopedia. John Wiley & Sons. p. 565. ISBN 9780471456032.